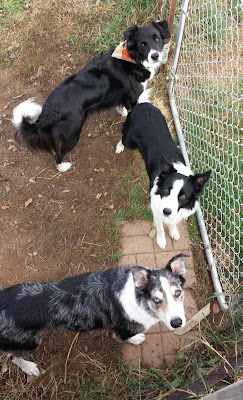 The Border Collie Is Out There! 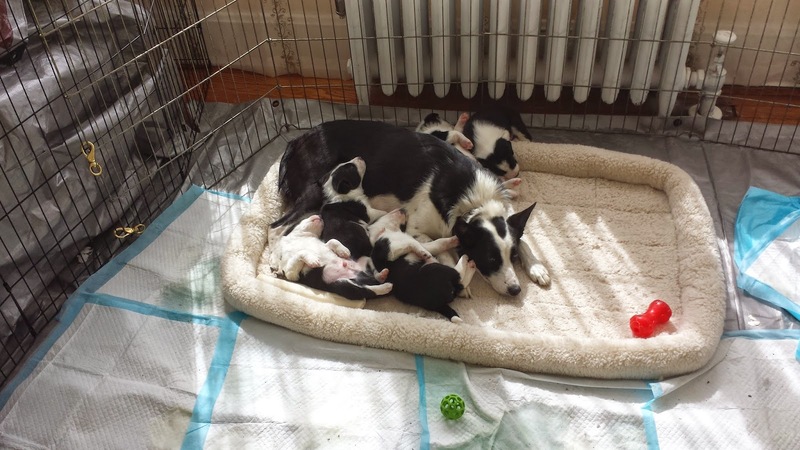 Thoughts and reflections as I prepare for a Border Collie puppy to join our household!! Bandit (orignally "Alder") is a happy, thriving young Border Collie boy!! I know now that he was always meant to be with us and I love him with all my heart. Well, OK, he splits it with Dean and Tessa, but you know what I mean! No regrets. No more angst over this boy. This was definitely meant to be! Since I am obviously not anticipating adding Bandit to our household anymore - he is almost two years old already! - I a going to start putting various and sundry notations on this blog. I cannot believe that in just two days I will have my new puppy! I will be able to hold him, play with him, and start to get to know him! Even though I've seen pictures, there is only so much a picture can convey. I am getting so eager to know who he will be. I already have a strong sense of gratitude toward this little puppy boy. I was thinking about the fact that since just a couple of weeks after losing Speedy and through Sammie being sick and losing him, even the thought of this puppy has helped me so much. He was always just a tiny little spark of hope and I can't imagine what it would have been like going through this without that. Now I am ready to get on with the business of getting to know this guy! A Pain? I Don't Care!!! I'm starting to get a little ticked off at the people who keep telling me that puppies are a pain. I know they mean well, but I really wish they would stop and think before saying it. First of all, I have done this before. Granted, Speedy was a pretty easy puppy in many ways. But he was a puppy. He had boundless energy. He used to just run right into walls at times, he was so nuts! He destroyed things. I had tote bags nailed to the wall in our Shendo house so we could put things up away from him because he would take things off of tables and shelves. He destroyed a pair of Ben's very expensive sunglasses. He destroyed and partially ate the wooden cross I had that was blessed by Pope John Paul II. When I started training Speedy, he thought everything meant to jump up in my face!!! I had to train Sammie to do everything I wanted to teach Speedy to do (to figure out how it would go) because Speedy wouldn't sit still long enough for me to get a thought in edgewise! He picked up targets and ran away with them and I had to use dinner plates to teach him targeting!! Oh, and add into that the fact that he was terrified of everyone and everything outside of our home and we lived in a busy town . . . I will say this with no reservation - I would do it all over again. I would gladly let Speedy destroy almost everything I own if I could have him back again even for a short time. I never think back on Speedy's puppyhood and think "he was a pain". I think it all went way too fast. Second, I have just lived with old dogs for the last few years. Although they are very different from puppies, old dogs aren't always easy. I had to lift Sammie onto the bed every night for over a year when he couldn't jump up anymore. I cleaned up countless accident spots when he couldn't hold his bladder sometimes. Old dogs need blood tests and medications, and over time you watch them be able to do less and less and less. Speedy got kind of odd and started eating and licking everything in sight. Know what? I don't look back on these last few years and think, "they were a pain". I think, "it wasn't enough time". I would have happily done what they needed for much longer than I needed to. The most insane run-ragged month of my life was the first month Dean was here. He was nuts. He had no self-discipline whatsoever. And he was a giant untrained 10 month old Border Collie. In some odd way I treasure the memory of that time. There was so much potential and I loved the work that I had to do to help him start to get a grip on his own mind. I guess the only dog who has ever come into this house and not been something of a pain at some time is Tessa. Honestly, I would rather that she had been able to come into my house a crazy and overly-energetic puppy!! My heart still breaks for her when I think of the life she had to live when she should have been someone's treasured and spoiled little princess girl. So . . . . he'll be a pain sometimes. I don't care. I want to welcome this puppy into my home. I want to give him the gift of a life where he never knows a day without love. I want to be the one who teaches him how to be a well behaved member of our household. I want to see those little eyes of his brimming over with fun and curiosity and a healthy sense of adventure. I want to enjoy this side of a dog's life for a change. I feel like I've been at the other end for far too long. And my new puppy is . . . . I am thrilled to pieces. I think he is just adorable. I really hadn't thought a lot about this one, and I hadn't been drawn strongly to his pictures at all. But when the breeder contacted me on Saturday and told me he was going to be mine, I knew he was exactly the right one!! Earlier that day, I had been driving along, alternately thinking about Sammie and Speedy and the new puppy. I have been very strongly committed to not allowing myself to make potential comparisons between Speedy and the new puppy. I know the new puppy will be very different, and I don't want to put the burden of comparison on him. But on Saturday I allowed myself one little tiny thing. I thought, "if I could say that there is just one quality that Speedy had that I would want the new puppy to have, what would that be?" I didn't have to think very long to come up with the answer. Right away I thought, "his joy". I thought, "If the puppy would be the type of dog who would regard the world with the same eager enthusiasm and joy that Speedy did, I would be perfectly happy". When I got home that day, I found the breeder's message. She described Alder in these words, "He is bubbly, happy, outgoing and absolutely delightful. He really is a perfect little creature". That's when I knew that he was my puppy and that he was always meant to be my dog!! Now I can't wait to meet him! Lots to do to get ready! No dog, no matter how extraordinary, will ever be Speedy. 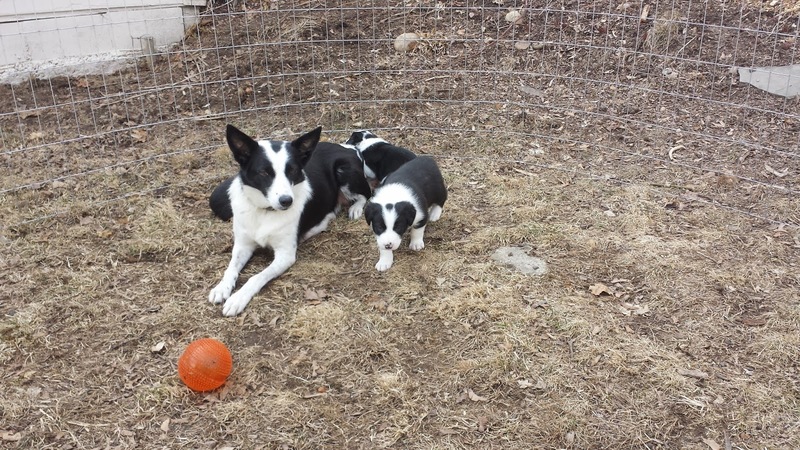 As I await the time when our new puppy will join us, I have been working to reconcile the fact that, although I am hoping that he will become my next Freestyle partner, this puppy will not take Speedy's place. No dog ever could. Recently I saw something - and I don't even remember what it was. I don't believe it was dog related. But it said that someone would be a successor, not a replacement. And I think it applies very much here. This puppy will be Speedy's successor. Hopefully, as he grows and develops, he will become Dean's ball buddy. Hopefully he will join Tessa and me on our hikes in the woods. He will be the dog in our household who came right to us from the breeder and never had any other home. 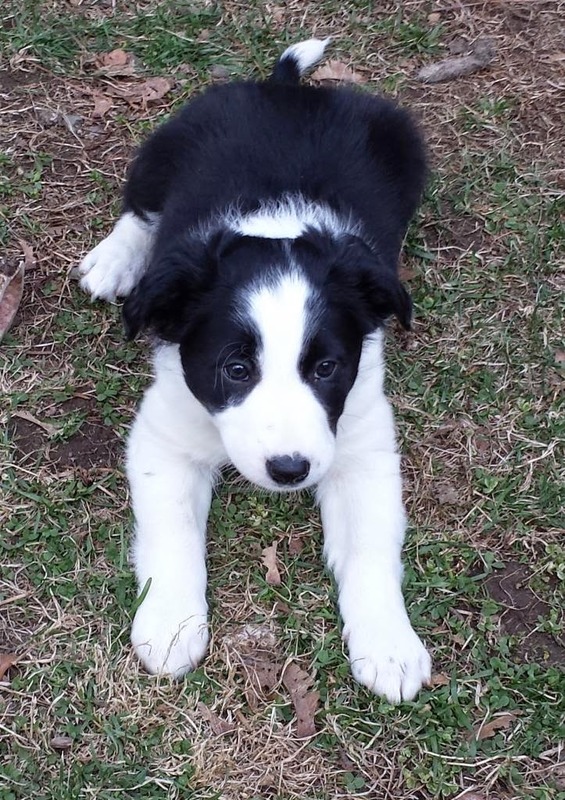 He will be one of the Border Collie boys. And, if he is willing, he will become my dance partner. But in all of that he will bring his own style, his own personality, and his own self. In thinking of him as Speedy's successor, I can kind of reconcile the place that he will have in our lives, without putting any burden of expectation on him. And that is a good thing. Four and a half weeks now . . .
We are going up to get our new puppy on Saturday, May 3rd, so just five weeks to go now!! 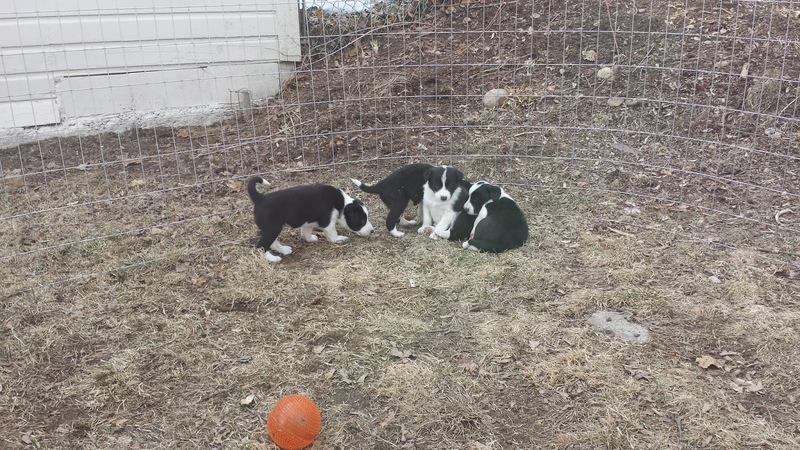 It has been so much fun to watch the puppies grow through pictures! Some recent photos . . .
Hawthorne, I believe, and Juniper, the Mom . . .
And the perfect picture of relaxation . . . I've been busy cleaning my house, getting ready to puppy proof! Two toys have been procured. I am really starting to think about what I need to do to get ready!